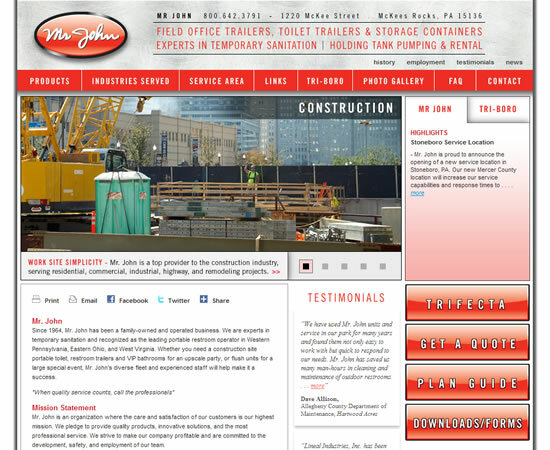 This was a double project, including the Mr John (Pittsburgh) website as well as the Triboro Trailers website. Both sites were designed by SG&D Communications and Design, and our role was to take their page design and write the html code to turn it into a website. The sites beautifully showcase the range of products and services provided by both companies, using jQuery for the fly out menus and photo photo galleries, and Flash for the image rotation on the home page. We also set up Google Analytics on this site so that the owners can see the volume of traffic coming to the site, view browser usage and operating systems, and even see the geographic location of site visitors. 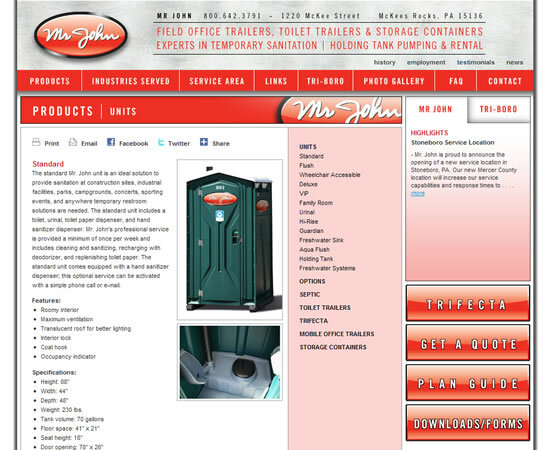 SG&D were responsible for the full Mr John of Pittsburgh rebranding project, and the website was featured as one of their success stories on their blog.